We so loved the “Action Spots” at our SPARK Summit that we decided to pull them together and put them online so people anywhere and everywhere could SPARKit in their own communities. Our SPARKit combines media literacy and youth inspired activism developed by some of our amazing partner orgs. Look for a new activity each month and try them all! 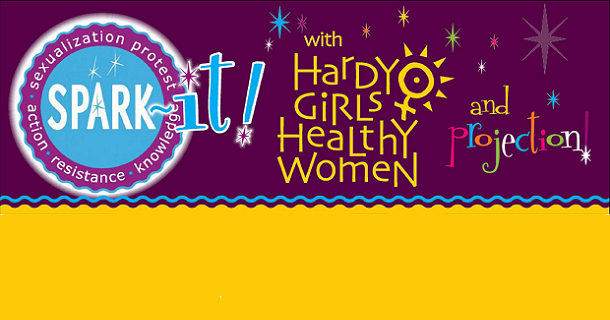 SPARKit with Hardy Girls Healthy Women and PROJECTION this month! 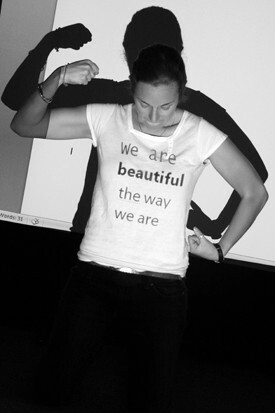 As an eating disorder survivor, Colby College student Aleah Starr developed PROJECTION to allow people to tell their stories anonymously and to push back the media and cultural messages projected onto girls’ (and guys’) bodies. At SPARK Summit’s PROJECTION “action spot” girls and their allies ttook part in PROJECTION by responding to the prompt: “If you could talk back to media, what would you say?” Click on the photo of Aleah to see a video of the PROJECTION albums and to download our SPARKit with PROJECTION directions. Each photo tells a unique story, more powerful because it combines an anonymous author’s statement with a model willing to stand up and speak for her or him. Be sure to send your story prompt and fave photos to us at info@hghw.org, so we can share them with all of our SPARK partners and supporters!